I was 6 years old the last time I played the role of “teacher” among my fellow peers as we innocently played “school.” You know that time in your life where you pretended to be like the older adults around you? I would pretend like I was the perfect teacher waving my ruler around commanding my poor peers to do as I say. Fast forward to now, I am in my 4th week of teaching English as a foreign language to South Korean middle school and high school students. In many ways, nothing has changed from that 6 year old girl that was playing “teacher” with her friends in that 1st grade classroom over two decades ago. I still get a slight thrill standing in front of a classroom. I still like to write on the white board just so I can see how pretty (or ugly) my handwriting has gotten and most notably, I still have don’t know wtf I am doing. Before coming to South Korea, the only teaching experience I had was the whopping 4 hours of teaching adults English for my TEFL Certification in Chicago. Other than that, I haven’t so much as even tutored a child or done anything of the like. I have spent all of my working life among adults in businesses both small and large. This whole teaching gig has taken me completely out of my element. So let me give you a glimpse of what the job entails. When I found out I was teaching middle school and high school students, I was extremely relieved because I honestly could not picture myself teaching young elementary school children. Little kids make me slightly nervous, mainly because I have not spent very much time around them and wouldn’t know how to handle their energy. The students can be rowdy at times, but they are always respectful towards me. My Korean co-teachers are all relatively young. Most of them are only 1-2 years younger than me, so they are approachable and welcoming. Unlike most, I did not meet the Principal when I first arrived which was rather odd because it seems customary that most new English teachers get introduced to the Principal in the very beginning. I didn’t meet mine until 3 weeks later and it was a random informal encounter in the hallway on my way to class. He seems like a pleasant man, but if I had to be honest…it seems like the Vice Principal works harder and is more intimidating than the actual head chief at my school. I bored 2 of my high schoolers to sleep! Ha! These lessons are spread out among different grade levels, but if you can’t already tell, I am all over the place! There’s no method in my madness. I have been dishing out whatever I think is useful or interesting but I am already running out of ideas! I haven’t exercised the creativity part of my brain in so long, that it’s hard for me to come up with fun lesson plans. I fear that I will be a boring English teacher and that’s the last thing I want to have happen! 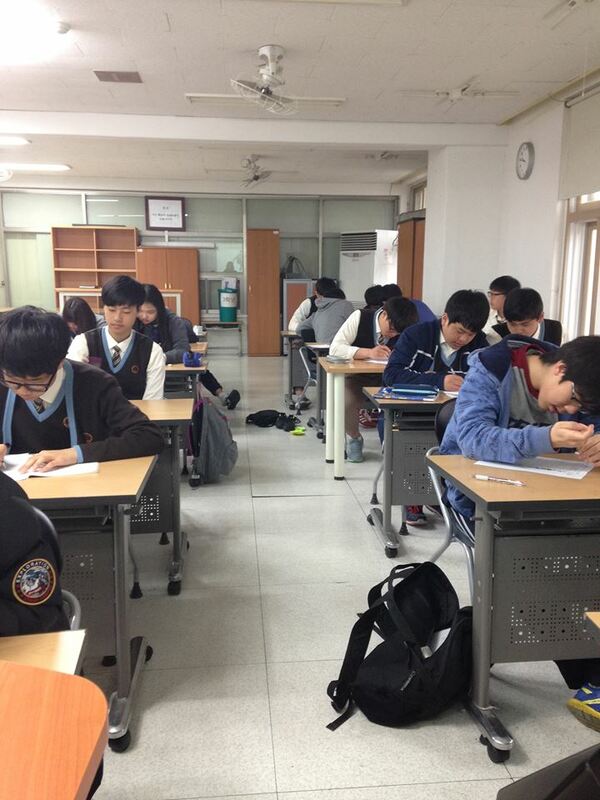 I mistakenly thought that I would only have 1 co-teacher before coming to Korea, but I have been blessed with 4. I have 1 main co-teacher, who is assigned to take care of all things work related and also help me with any troubles with my apartment. I always teach along side one of them during a class, and most of them translate what I say into Korean for the students who have a hard time understanding. For the most part, my co-teachers are awesome. However, there have been times when communication is lacking. Although, I have no problem understanding their English…. it seems that a few of the teachers will avoid speaking English unless they absolutely have to. My main co-teacher is extremely standoffish, and awkward at times because she is shy or insecure about her English speaking abilities. I hope that she will open up more as time progresses, but we shall see. The barrier of work relationships is hard to crack. It seems unlikely that I will be hanging out with my Korean co-workers outside of work simply because most of them travel back to their home cities on the weekends and they have not expressed the slightest interest in “hanging out.” Who knows though…. anything is possible! It’s only been a month; I am determined to hang out with at least one of them outside of work before this year is over. I knew that there would be no official orientation or job briefing of any kind until a month after working. The time for EPIK Orientation is finally here! It will be a 6-day event held at the National Institute for International Education (NIIED) in Seoul. I am excited to re-unite with the handful of other teachers that I very briefly got acquainted with during the first night and day of arriving in Korea. I’ve been anxiously waiting to meet more people going through the similar pleasures and pains of adjusting to living and working abroad. It sucked being accepted late and not being able to network with others right away. I will finally get that opportunity come tomorrow. God knows I am longing for connections, now more than ever. Overall, I like my job. There is much to learn and always room for improvement. 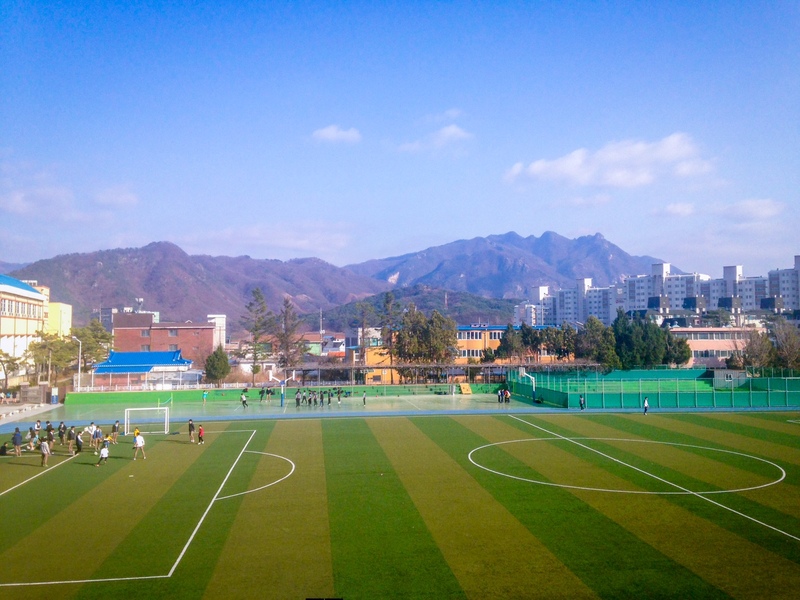 I moved to South Korea because I wanted a change, and I definitely got it. I did not come here without a purpose. I came here to teach and to be taught. God forbid, if I ever lost sight of that purpose…it will be time to move onto another place. But it’s only been a month; I think I’ll stay for a while. I have so much more to share. Stay tuned and thanks for reading. This entry was posted in EPIK, Korea, TEACH, Teaching and tagged Expatlife, Expatriate, Korea, LessonPlanning, SouthKorea, TEACH, Teacher, Teaching, Teaching English, TEFL, TESOL, Workingabroad. Bookmark the permalink. Hang in there; EPIK can be a tough gig for many of the reasons you mention. It’s far from perfect, but if your goal is learning a lot, you came to the right place. Hi, are you teaching in a public school?